By Atlantic - Gem of Gems by Strathconan. Le Sancy was a sturdy, long-running racehorse whose best distances were 1-1/4 to 1-1/2 miles, although he won at both shorter and longer distances in his four seasons on the turf. He became a sire of great influence in France, and his grandson, Roi Herode, revived the Herod sire line in Great Britain via his son, The Tetrarch. Atlantic Le Sancy's sire, Atlantic (1871), was bred by Viscount Falmouth at his county seat, Mereworth, in Kent, England. He was out of the 1,000 Guineas winning mare, Hurricane, by Wild Dayrell. His dam also produced a sister, Atlantis (1867), who won five races in her eleven starts, including the Clearwell and Prendergast Stakes. 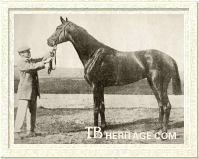 Trained by Mat Dawson, Atlantic was the best son, both on the turf and in the breeding shed, of Derby winner Thormanby. At age two Atlantic won the Ham Stakes at Goodwood, beating the future triple classic-winning filly Apology, and the Buckenham Stakes, showing, as many Thormanby offspring did, his precocious turn of speed. At age three he won the 2,000 Guineas. He "met with an accident while on his way by train to Epsom; and was, therefore not at his best when beaten in the Derby by George Frederick and Couronne de Fer." He ran second in the 1 mile-5 furlong Prince of Wales' Stakes, carrying 9st. llb. to the winner's 8 st. 3lb., and then first in the Ascot Derby. He ran unplaced in the Doncaster St. Leger, his last race, won by Apology. At the end of the 1874 season, Falmouth sold Atlantic to Baron Arthur de Schickler in France, who installed him at his Haras de Martinvast, near Cherbourg, alongside the aged black stallion Suzerain, and the Vermout son Perplexe. The Baron retained many of Atlantic's offspring, and Atlantic's son, Le Sancy, became the principal stallion at Martinvast upon his retirement from the turf, where he produced a number of runners for Schickler. Atlantic was an elegant animal with a long neck and good shoulder, but his hind legs were a bit straight, something he passed on to his son, Le Sancy. He was "as mean as Perplexe is sweet," and that temperament was periodically passed on -- Le Sancy had a temper as a younger horse, and Le Sancy's grandson, the two-time leading sire Alcantara II became so savage as he aged that he was destroyed. Atlantic died at Martinvast in 1891, age twenty. In France Atlantic sired some moderately good race horses and in 1890 was at the top of the sires list, largely due to Le Sancy. His best racing son, other than Le Sancy, was Fitz Roya (1887, from Perplexite), bred at Martinvast and raced by Schickler, who was the best of his year at age three: he won the Triennial, the Prix de Malleret, the Prix de Juin, and the Grand Prix de Paris, and ran third in the Prix du Jockey Club (French Derby). He stood at stud at Haras de Saint-James, the stud farm belonging to Jean Stern, and died in 1896, at the age of nine. Atlantic's son Le Capricorn (1888, from La Dauphine, also the dam of the Le Sancy colt LE SAGITTAIRE), also bred at Martinvast and raced by Schickler, won the Prix du Jubilee de la Fondation de Bade (Germany), at age three. 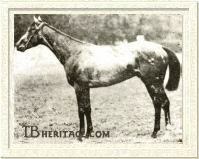 Le Capricorn was later the sire of the great race filly Punta Gorda (1902, from Galliard daughter Philae). Punta Gorda won eleven races in 27 starts at age three, and was one of the top older horses at ages four and five, winning six races at age 4 from 23 starts, including the Prix d'Amphitrite and the Prix d'Inauguration at Tremblay, and running second to Maintenon in several top races, and at age 5 winning 8 of her 22 starts. Her career total was 466,278 francs, which she won over all distances on all types of courses. Atlantic's son Fousi-Yama (1890, from the Hermit mare Little Sister) was a good two year old, winning the Prix de la Salamandre for Schickler. His next good wins were at age five, when he won the Prix Boiard (2000 meters), the Prix du Cadran (4000 meters), and the Prix La Rochette (1600 meters). Ravioli (1891 from the See Saw mare Japonica), bred and raced by Schickler, won the Prix du Naba, the Prix Monarque and the Prix du Prince d'Orange (2000 meters) at age three. Fousi-Yama's sister, Pietra Mala (1892), won the Prix de Saint-Firmin at age two, and at three won Prix des Dunes and ran third in Prix du Nabob and the French 1,000 Guineas; she was the dam of the useful horse Magellan (by Perth), and of La Semillante (1909), who became a good broodmare. Atlantic's son, Cherbourg (1892, from the Hermit mare Cherie), won the Criterium de Maisons-Laffitte by eight lengths, and the Prix de Sablonville at age two. Cherboug trained on to run in top company: at age 3 he won the Prix du Nabob , and ran second to Omnium II in the Prix du Jockey Club (French Derby), in which Le Sagittaire failed to place, and also ran second in the Grand Prix de Paris, to Andree, beating Le Sagittaire (third). Gem of Gems Le Sancy's dam, the grey Gem of Gems (1873), was out of Poinsettia (1866), whose dam, Lady Hawthorn (by Windhound), was one of the great Alice Hawthorn's daughters. Poinsettia was by Young Melbourne, who had a truncated racing career, whose sire, Melbourne, was a great stayer. Poinsetta ran fifteen times between the ages of two and four, winning one £395 race. Gem of Gems, by the grey Strathconan, did not do well on the turf, but another daughter of Poinsettia, Ellangowan (1876), who was sister to Gem of Gems, was a fair juvenile who won The Criterion Nursery Stakes at Newmarket and the Chaplin Stakes at Lincoln, at age three won three races, including the Lonsdale Plate at York, finishing her career by winning York's Great Northern Handicap and placing third once in eleven starts at age four. Gem of Gems, in foal to Doncaster, was purchased by Baron Schickler. The foal, born in 1882, was a bay filly, Escarboucle, who could not beat the good filly Barberine in the top filly races--the French 1,000 Guineas and the French Oaks --but who did win the Prix Royal-Oak (French St. Leger) at age three. The next year (1886) she went on to win the Prix Gladiateur (4800 meters), confirming her ability to stay. She was retired to Schickler's stud at Martinvast, where she produced some foals to both Perplexe and Atlantic, the best being the Perplexe son Fra Angelico (1889), who won the French 2,000 Guineas, the Prix de la Foret, the Prix Greffhule, and the prix de l'Avenir and the Zukunfst-Rennen in Baden-Baden Germany. Gem of Gems produced a number of other foals at Martinvast, mostly to Atlantic, but also to Perplexe and King Lud, but none had the class of Escarboucle or Le Sancy. Some of Gem of Gem's daughters bred on, and through them her name is seen in pedigrees in France, Chile, Brazil and the U.S. Le Sancy was born in 1884. He eventually reached 16.1-3/4 hands in height, although he was a very late maturer. He had an excellent shoulder and an extremely powerful hind end, although he inherited his sire's straightness behind. His legs were excellent, and at the end of six years of running they were as clean as the day he began racing. Those who saw him, such as the American turf writer Thomas Merry, remarked on his "hard finish," and Merry, who saw Le Sancy just before he died, also noted that he had "the best legs and feet I ever saw under a horse of his age." He had a bit of his sire's temper as a youngster, but became more manageable as he aged. He was placed in training with Schickler's private trainer, English-born William Webb, who had begun his long and successful association with Schickler in 1878. Le Sancy's early turf career was erratic, and nothing like that of the horse to whom he was later most compared, the undefeated St. Simon. Still, he ran much longer than St. Simon, and much harder, and he was almost undefeated at ages five and six. Some turf observers believed quite strongly that his racing career was mis-managed; his jockeys were often instructed to hold him back, rather than let him take the lead, although in a number of races which he won, such as the Prix Daru, it appeared that was his preferred style of running. In addition, some observers felt he had no endurance, but his defenders pointed to his lack of conditioning for the longer races that he lost; certainly many of his sons and grandsons showed a distinct aptitude for distance races. Le Sancy debuted at age two in the Prix de Villiers at Deauville, where he ran third to Grapotel and Saint-Luc. He did not place in the Prix de Deux Ans, but a few days later he won the Grand Criterium de Dieppe. He followed that by a loss by half a length to Frapotel in the big two year old event, the Grand Criterium, in Paris. At age three, he was beaten by a neck by Brio in the French 2,000 Guineas. That was followed by an easy win in the Prix Daru (2100 meters), where he led from the start. He did not place in the Prix du Jockey Club (French Derby) or in the Grand Prix de Paris, the two most important races in France at the time. In his next race, the Prix d' October, he was beaten by 3/4 of a length by Bavarde. He ran unplaced in his last race of the year, the Prix de la Foret. At four, he did not place place in the Handicap de Paris. He walked-over for wins in the Prix de Neuilly, the Prix d'Apremont, the Prix de Chantilly, the Prix de Lonray, and the Prix d'Escoville. He was beaten by a head by Bavarde in the Prix de Seine-et-Marne at Fontainebleau, and then won the Prix Guillaume -le-Conquerant at Deauville. He lost by a neck to Galaor in the Grand Prix de Paris. Shipped to England, he ran in the Lancashire Plate at Manchester, where he ran third. Back in France, he did not place in the Prix de la Foret, but he followed that by a win in the Prix de Bois-Roussel. At ages five and six, finally mature and still completely sound, he had his best years. He lost two races at the start of his fourth season, age five, then won the Prix des Sablons (2100 meters) by 3/4 of a length. He did not place in the Prix de Lutece, his last defeat for the rest of his career, save one race, the Prix Gladiateur. In these two seasons he easily won nineteen races, three of which were walk-overs. At age five these included: Prix de Courbevoie, Prix d'Apremont, Prix de Lonray, Prix d'Escoville, Prix d'Ispahan (1850 meters) (in both the latter carrying the heaviest weight), Prix Guillaume-le-conquerant; Prix des Dunes, Grand Prix de Deauville (2600 meters), and the Prix de Bois-Roussel. At age six his wins were the Prix des Sablons (2100 meters), the Prix Hedouville, the Prix de Lonray, the Prix d'Escoville, the Prix de Deauville, the Prix Bel-Ebat at Maisons-Laffitte, the Grand Prix du Sart at Spa, the Prix Guillaume-le-Conquerant, and the Grand Prix de Deauville for the second time. In all, Le Sancy ran forty-three times, winning 27 seven races and placing nine times. Le Sancy's influence at stud in France was likened to that of St. Simon's in England. His stud fee was the equivalent of the 500 guineas charged for St. Simon. Almost all of his youngsters could win at classic distances and beyond, and many got better as they aged. He sired two winners of the Prix du Jockey Club (French Derby), and two of the Prix Royal-Oak (French St. Leger), and two winners of the French 1,000 Guineas, one of whom also won the French Oaks. Right from the start he got some precocious juveniles, some of whom later trained on, and he also sired some excellent stayers who won the principal distance races in France, and got a number of good winners over jumps as well. He was leading sire in France four times -- in 1895, 1987, 1900 and 1903. 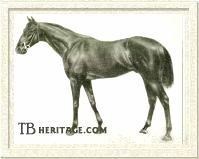 Le Sancy also was a sire of sires, his most notable son being LE SAMARITAIN, who, as sire of Roi Herode, and so grandsire of The Tetrarch, revitalized the Herod sire line in Great Britain; Le Samaritain also had a major influence on breeding in South America, through his daughters, particularly Gladiadora, dam of "El Fenomeno Blanco," the grey Oakland, who became a leading sire in Chile. In France, Le Sancy's son Le Sagittaire, who led the sire's list once, got the dual classic winner Maintenon, who himself became a leading sire. Another Le Sancy son, Ex Voto, became a top sire of steeplechasers, and another, St. Saulge was leading sire both in Belgium and in Poland and became the grandsire of Ramzes, an Anglo-Arab of enormous influence in sporthorse breeding. His first crop debuted as two year olds in 1894, and created a bit of excitement on the French turf because so many did so well: he had five winners, four colts and a filly, of some of the top two year old races, in all ten juvenile races at Deauville, Paris, and elsewhere were won by his first youngsters. Many of his offspring ran at least through age four, and a number of them improved the longer they ran, inheriting their sire's excellent constitution and soundness. Le Sancy spent his entire stud life at Baron de Schickler's stud, Haras Martinvast, where he was born; he died early, in 1900, age 16. Le Samaritain The grey LE SAMARITAIN was bred at Martinvast, out of Clementina, a daughter of Doncaster, in 1895. Clementina ran twice at the age of two, placing once. Le Samaritain ran five times at age 2, and placed in three of his races, but didn't win any of them. At age three he improved significantly, winning five of his twelve races. Running for Baron de Schickler, his breeder, he won the Prix de Guiche, the Prix Daru, and Prix des Acacias, at distances between 9 furlongs and 10 1/2 furlongs ( 1-1/4 mile). He was then sold to the Comte Max Foy, for whom he won the Grand Saint-Leger de France at Caen, and the Grand Prix de Deauville, the latter at 2600 meters (over 1-1/2 miles). LE SAMARITAIN was shipped across the channel to run in England, but failed to place in either the Duke of York Stakes or the City and Suburban Handicap there. At age 4, he won the Prix de la Jonchere (1600 meters), and ran second twice and third twice, retiring from the turf with winnings of 35,000 francs. In France, LE SAMARITAIN'S best racing son was the grey Isard II (1910), from a Kilwarlin daughter, Irish Idyll, who won six of his eighteen races between the ages of two and four for Baron Edouard de Rothschild, including the Grand Prix de Deauville and the Prix Boiard (2000 meters, 1-1/4 miles), and ran second to Bršleur in the Prix Royal Oak (3100 meters); he failed to place in the Prix du Jockey Club (French Derby), and the Grand Prix de Paris, which was won by Bršleur. In the stud he got the French Derby winner Belfonds (later sire of four classic winners in France), the French 1,000 Guineas winner Frisky (dam of the good stayer Nepenthe), and the great stayer Filibert de Savoie, who won the Grand Prix de Paris and other top staying races in France and ran second in the Ascot Gold Cup. The latter, sent to Italy, sired Emanuele Filiberto, a winner of the Italian Derby. The other important son of LE SAMARITAIN bred in France by Foy at his Haras de Barbeville was another grey, Roi Herode, (1904) from the good French racing filly Roxelane by War Dance. He ran in twenty four races over the course of his four years on the turf, and won three, the only principal one being the Prix de la Ville de Vichy over 2600 meters when he was 4 years old. However, he was second in some important races, including the Prix Royal Oak (at age 3 -- 3100 meters) and the Doncaster Cup (at age 4 -- 2 miles, 24 yards) in England, and ran third in the 3,000 meter Prix Hocquart at age 5. He was purchased, while still in training, by Edward Kennedy of Bishopscourt, County Kildare, with the intent of restoring "the lost line of Herod" to Britain. Kennedy sent him to trainer Atty Persse for a fifth season of running; while prepping for the Chester Cup of 1910, he broke down, and was sent to Kennedy's Straffan Stud in Ireland. He bred three mares that year, including Vahren, by Bona Vista, who had won three races at distances between 9 and 11 furlongs. The following year she produced The Tetrarch, born a chestnut with the black spots seen on Thormanby, to whom he had five lines; as he aged The Tetrarch turned grey, and his coat developed white spots as well. 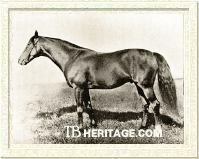 The Tetrarch was a brilliantly fast two year old and highly influential sire. Other The TetrarchRoi Herode offspring were modest racehorses, but a number of his daughters were influential broodmares, such as May Queen -- dam of French Derby and Grand Prix de Paris winner Strip the Willow -- and La Grisette, who, in the U.S., was second dam of the grey Miyako (the granddam of Native Dancer) and of the grey Planetoid, dam of the great producer Grey Flight. LE SAMARITAIN was sold to South America. In Argentina he sired some very good daughters, and a son, Grey Fox, who won fourteen races and was the only horse to ever beat the top Argentinian horse Botafogo. Grey Fox was exported from Argentina back to the country of his sire's birth where he stood at stud; his daughter, Grey Gown, produced Blue Grass, by Papyrus, who was exported back to South America (Brazil) in 1940, where he got the top Brazilian racehorse Quiprocuo. Of Le Samaritain's South American daughters, one of the more important was the grey Gladiadora (born in Argentina in 1915, from Exmoor daughter Palestra). Imported into Chile by Pedro Maldini, she won seven of her sixty races between the ages of three and six. She became the top foundation mare for Haras Kangaroo, later passing on to other studs before dying at age 25; in all she produced ten foals, her best was Oakland (1923), "El Fenomeno Blanco," winner of 26 of his 42 races at distances between 1100 and 3800 meters. He was leading sire in Chile in 1949 and was second on the list in three consecutive years, 1944-1946; in addition, he was a top broodmare sire. Another good daughter of Le Samaritain in South America was Sevillana (1913), dam of the excellent long-distance horse, named Stayer, who won the 4,000 meters Pueyrredon twice, the General Belgrano twice, and the 3500 meter Chacabuco y el Honor, and who was a successful sire of some top horses, including Scarone and Lunar, who both won classics in Uruguay and Brazil. Clementina produced a second grey son to Le Sancy, called HEBRON (1900). He was a moderately good juvenile who won the Criterium at Maisons-Laffitte. At age three he won the Grand Prix de Nice, and at age four he was one of the better older horses, winning five races, including the Prix de Bois-Roussel, the Prix de Perth, the Prix de Consul, and the Prix du Pin. 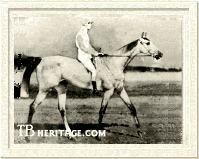 He was a useful sire, among his offspring was Ulm (1907), winner of the Prix de Rochette (7 furlongs) at Longchamp. Both Le Samaritain and Hebron were in-bred 3 x 4 to Newminster. Le Sagittaire LE SAGITTAIRE (1892) was another grey colt bred at Schickler's Haras du Martinvast; he was out of the unraced grey La Dauphine, a Doncaster daughter, like Le Samaritain's dam. Like most of Le Sancy's offspring, he also was best on the turf at distances over 9 furlongs. In Le Sancy's first crop to run, at age two he won the Prix de Villiers, the Prix de Deux Ans, both at Deauville, and the Grand Criterium in Paris. At age three he was near the top of his generation. He won two races, the Prix Greffulhe (2100 meters), and the Grande Poule, and ran second in the Prix de Conseil Municipal (2400 meters), and third in the Grand Prix de Paris, winning 159,725 francs that year in prizes. At age four (1896), he was rated second to the great Upas colt, Omnium II. He ran third to Omnium II and to the Le Sancy colt LE JUSTICIER in the Prix Boiard (2000 meters), beaten by half a length, and then ran second, by a neck, to Omnium II in the Prix du Cadran (4000 meters). He won the Prix des Sablons (2100 meters), beating Omnium II. LE SAGITTAIRE was a successful sire, and led the sire's list in France in 1906, the year his best son on the turf, Maintenon (1903, out of Marcia by Marden), won thirteen -- out of his career total of nineteen -- races, including the Prix du Jockey Club (French Derby), the Prix Hocquart, the Prix Lupin, the Prix du President da la Republique, the Prix Monarque, the Prix de Longchamp, the Guillame-le-Conquerant, the Grand Prix de Deauville, the Prix Royal-Oak, and the Prix du Conseil Municipal. The next year Maintenon won the Prix des Sablons in a canter, and then the Prix BoÔard; he inexplicably lost to a modest horse, Querido, in the Biennial de Longchamp, after which it was discovered he had injured his leg sufficiently to permanently retire from the turf; he later headed the French leading sires list. Maintenon had been purchased by American William Vanderbilt as a yearling from the Haras du Perray, owned by M. Gaston-Dreyfus, for 23,000 francs. He was retired to stud at Haras de Villlebon, and later moved to Vanderbilt's Haras du Quesnay, where he unexpectedly produced mostly precocious speedsters. Maintenon was France's leading sire in 1917. Diavolezza, LE SAGITTAIRE'S daughter out of the Ladas mare St. Astra, won France's 1,000 Guineas stakes at Longchamp for Edouard de Rothschild, and placed in several other good races. In the stud she produced Celerina (1928, by Teddy), who also won the 1,000 Guinea in France, and the 2600 meter Grand Prix de Deauville. Diavolezza bred several other winners by the great stallion Sardanapale, and another daughter, Farizade, that bred on with tail-female descendants that included Prince Chevalier, Pharly, and Soviet Star. LE SAGITTAIRE also sired My Star, who won a number of races in France; Amer Picon, a great stayer that won the 4000 meter Prix de Satory, the 3600 meter Handicap d'Automne, the Prix Rainbow, and the Prix Gladiateur (twice), among other top distance races; Ossian (1906), who won the Prix du Sablons (2100 meters), the Prix du Conseil Municipal, and several other races and later was a fair sire; Valda (1905), who won the Prix Mornay (1250 meters), the Prix de la Foret, and several other races; a number of his other daughters bred on. Holocauste EX VOTO (1900), was out of Golden Rod, a modest winner in England at ages 2 and 3, by Bend Or, and bred by Baron Schickler. His juvenile year was unspectacular, with no wins. At age three, running for the Comte de Pourtales, he won the Prix Hocquart (2400 meters) in good style, but then ran unplaced in the French 2,000 Guineas and the Prix Lupin at Longchamp (2100 meters), and ran at very unfavorable odds as an extreme outsider for the Prix du Jockey Club (French Derby), surprising all by winning it by half a length over Quo Vadis and a group of other good horses, including the favorite, Vinicius, who didn't place. He then failed to place in the Grand Prix de Paris (won by Quo Vadis), and the Prix Royal Oak (won by Torquato Tasso). Then he beat Caius -- who had been second in the Grand Prix de Paris and went on to win top races at ages four and five -- in the Prix de Longchamp at Deauville, and finished the season by winning the Prix du Tibre at Maissons-Laffitte. In the stud he made a name for himself as a sire of steeplechasers. His offspring included Heros XII, L'yser, and Le Fils de la Lune, all winners of the Grand Steeple-Chase de Paris, and Dan IV, who was purchased to the U.S., where he won the American Grand National and some other good races, and was later a sire for the U.S. Army remount service. EX VOTO'S name is seen periodically in the pedigrees of international show jumpers. The grey HOLOCAUSTE (1896) was Le Sancy's best son on the turf. His dam was Bougie, by Bruce, who won the Prix du Conde at age two, and placed in some other races as a juvenile. She also produced Gardefeu (By Cambyse), who won a number of top races at age three, including the Prix du Jockey Club, and his sister, the filly Ignita. HOLOCAUSTE was the best of his generation at age two, winning the Criterium de Maisons-Laffitte in a canter, followed by the Grand Criterium, beating Perth (by War Dance) -- who didn't place -- and the Prix Le Destrier. At age three he barely lost the Prix Lagrange to the little-regarded Mie, which was considered a big upset. Following that he won the Biennial in a canter, the Prix de La Rochette, and the Prix Lupin, in the latter beating Velasquez by six lengths. He met Perth in the Prix du Jockey Club, an event highly anticipated by turfites, Perth having won a number of good races preceding it; HOLOCAUSTE was favored 1:2 and Perth was at 7:2. Two things happened in that race. First, he lost a few strides, seeming to slow significantly, early in the race, then again picked up his great long strides and caught the rest of the field. Second, as he approached the leaders, gaining fast, his jockey elected to try and move between horses, rather than continue to the outside, and HOLOCAUSTE was hemmed in until too late to make up the ground to Perth before the race was over. Many blamed his jockey for his loss. His was sent to England to run in the Epsom Derby a few days later; his principal opponent would be Flying Fox, who went on to win the English Triple Crown. One of Holocauste's legs had some swelling in it on the eve of the race, but it responded to treatment, and he started in the race--delayed an hour due to false starts--ridden by American Ted Sloan. He led from the start, and by the next to last turn of the race, there were only two horses in it: Flying Fox and Holocauste, and Sloan had yet to ask HOLOCAUSTE to really run. He never got the chance; HOLOCAUSTE suddenly stopped, "turned on himself and fell," leaving Flying Fox to win in a canter. Holocauste had broken his leg, and was put down on the spot; a later autopsy indicated, from the nature of the fracture, in which the bones were completely fragmented, that he had cracked his leg at Chantilly during that brief hesitation during the running, and the stress of running on it at Epsom finished him. Sloan always maintained that HOLOCAUSTE had Flying Fox beat in that race. LE JUSTICIER (1892) was another of Le Sancy's first crop, bred by Schickler. His dam was the imported English mare, North Wiltshire, by Parmesan. Along with Le Sagittaire and others in Le Sancy's first crop, he won some races at age two: the Prix de Chenes at Paris, and Prix de Conde at Chantilly, and he was second in the Prix la Rochette. Like Le Sagittaire, he was among the top three year olds of his generation, but not quite top class, and he won three races from his ten starts, including the Prix due Cedre and the Prix de Seine-et-Marne, and ran second in the Prix Daru, the Prix Royal-Oak, and the Prix du Prince d'Orange; shipped to England that year to run, he won the Eclipse Stakes also. At age four LE JUSTICIER, like LE SAGITTAIRE, wasn't quite as good as the top Upas son, Omnium II, but he did win the Prix d'Escoville, the Prix d'Hedouville at Chantilly, the Prix de Bois Roussel, and Deauville's Prix Guillaume le Conquerant, and ran third in both the Prix du Prince d'Orange (beaten by a neck by Omnium II), and the Prince of Wales's Stakes at Baden-Baden. He was sold to the German National Stud at Graditz in 1896. Another from Le Sancy's first crop was LE HADJI, who won the Prix Upas and the Prix Le Destrier at Maisons Laffite at age two. 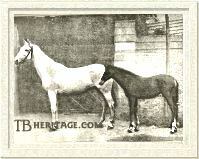 Other sons of Le Sancy who did well on the turf included CHAMBERTIN and PALMISTE, both foals of 1894. PALMISTE, a Martinvast Stud product, was out of Perplexite (1878), by Perplexe, a good race mare who had won the Grand Criterium at age two and the Prix Royal-Oak (French St. Leger) at age three. She was a really top producer, dam of the Atlantic son, Fitz Roya, and of the 1889 Narcisse colt, Chene Royal, who won the French Derby and a number of other top races. PALMISTE had been a good two year old, second to the great filly Roxelane in the Grand Criterium, but suffered trouble with his teeth after that and did not run again until age three. He won the French Derby, and Longchamp's Prix Greffuhle (2100 meters, beating Le Sancy's CHAMBERTIN), and the Prix Lupin (2100 meters), and has some bad luck in strategy during the Grand Prix de Paris and ran unplaced. Perplexite was also the dam of the Le Sancy son BUISSON ARDENT (1895, not to be confused with the later Buisson Ardent by Relic), who did not do much on the turf. CHAMBERTIN was a great stayer. His dam, Chopine, by Stracchino, had won the Second Criterium at Longchamp at age two, and at age three had won the Prix Vanteaux and the Prix Greffhule (2100 meters). Chambertin won the Great St. Leger de France and the Prix Royal-Oak, and the Prix du Cadran (4000 meters). His full brother, Champignol (1893), won the Prix Lupin (2100 meters) at Longchamp, and the Prix LaGrange at Maisons-Laffitte. 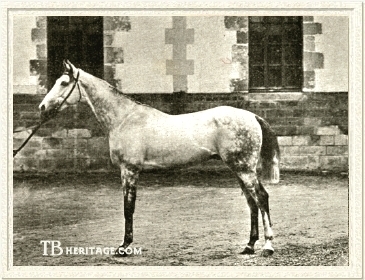 The grey Le Sancy son ST. SAULGE (1899), from the Silvio daughter Maypole, went to stud in Belgium, where, standing at Vicomte de Buissert's stud at Seneffe, near Brussels, he became leading sire in 1914, due in part to his son, Cornimont, winning the Belgian Derby. St. Saulge sired Barbara Belle in Poland, who was winner of classic races there, and due largely to her wins, he was leading sire in Poland in 1922. 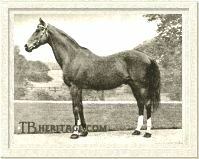 ST. SAULGE'S son, Rittersporn, was bred in Belgium and raced over fences; he sired Ramzes (1938), an Anglo-Arabian born at the National Stud in Poland, who was exported to Germany and became first, a coach horse and hunter, then a decent show jumper, and then an outstanding sire of world-class show jumpers who is seen in the pedigrees of all major warmblood breeds. Another Le Sancy son, LE PURITAIN, was also sent to Belgium, where he was several times in the top ten in the leading sires list. A number of other Le Sancy sons won good races in France, for example, at age three the grey LE FLAMBEAU (1900) won the Prix Delatre and the Prix Lagrange, and ran second to Alpha in the Prix Monarque and LE BASILAC (1893) ran second in the French 2,000 Guineas. Many of Le Sancy's daughters were good runners, the best being the grey SEMENDRIA, who was one of France's top fillies of the 20th century. Le Sancy was also a good broodmare sire, with many daughters producing stakes winners, and several produced classic winners in France and England. One, Toison d' Or, became the dam of Alcantara II, twice leading sire in France. Tagale and Blankney II The grey SEMENDRIA (1897) was an oustanding race filly, the top of her generation at age three. She was bred by Schickler, out of Czardas, by Epsom Derby and Grand Prix de Paris winner Kisber. Czardas also produced Ragotsky, another Martinvast-bred colt, by Perplexe, who won both the French Derby and the Grand Prix de Paris. SEMENDRIA ran twice at age two, winning both events, the Criterium International and the Prix de la Foret. At age three she easily one the French 1,000 Guineas by three lengths, and after a surprising defeat in the Prix Lupin, won the French Oaks. Her next win was the Grand Prix de Paris, over the top colts of her day, and in the fall of her three year old year she won the Prix de Flore and the Prix Vermeille, but ran second to Codoman in the Counseil Municipal, giving him 9 pounds. At age four she won three races, the Prix Hedouville, the Prix de la Jonchere, and the Grand Prix Baden-Baden. Through her daughters, she was tail-female ancestress of French Derby and Grand Prix de Paris winner Mordant (1904), and of Prix de l'Arc de Triomphe (and six other good races) winner and good sire Biribi (1923). BEATRIX (1892), one of Le Sancy's first crop, was out of the Kingcraft mare Leap Year. Bred at Martinvast, she was sold to the Comte de Pourtales, for whom she won the Prix de Honfleur at Deauville, and ran second to Le Sagittaire in the Grand Criterium in Paris, and also placed second in the Prix Eclipse. She became the dam of Strozzi (1902, by Callistrate), who won the Prix de Cadran (4000 meters), among other races and was later a good sire. 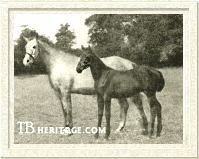 Her full sister, Invicta (1894), with tail-female ancestress of good stakes winners in England and France. Le Sancy's daughter XYLENE (1901), from Factory Girl by Plebian, was owned by the Comte de Pourtales. She won the French 1,000 Guineas, and ran third in the Prix de Vermeille. Another daughter, LA LORLEY (1899, from the Bend Or daughter Orris), was a good juvenile, and at age three won the Prix d'Amphitrite and the Prix de Flore, in the latter beating the great race filly Kizil-Kourgan (by Omnium II), who had beaten her by a neck in the French Oaks. SAF SAF (1892), from Caterer daughter Athalie, produced the great runner Sea Sick (1905, by Elf), who by winning the Prix du Jockey Club (French Derby), and other top races, was the top three year old of his generation. THE OTHER EYE (1894), by Commoner, foaled three good producing daughters to Le Sancy. 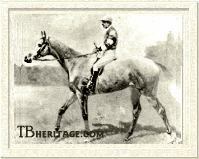 The first, Tagale (1900) won a small race at age two, and did not place in her six races at age three. She was bred to English Triple Crown winner Flying Fox in France, and then was sold to Walter Raphael in England, where she foaled Blankney II, who won the Gimcrack Stakes. Bred to Cyllene in 1908, she produced the grey race filly Tagalie, who won the 1,000 Guineas and the Epsom Derby, the fifth filly to ever win that race. The second Le Sancy daughter out of THE OTHER EYE was Zingara (1901), also useless on the turf, but in the stud, bred to Grand Prix de Paris winner Sans Souci II, she produced Sans le Sou who became a fair sire; his brother, Zagreus, who won the Grand Prix de Deauville and the Prix de la Rochette twice; and their sister, Zanetta, who was tail-female ancestress of good winners in France and the U.S. The third daughter of THE OTHER EYE and Le Sancy was Cypriote (1902), who won the Prix Saida. 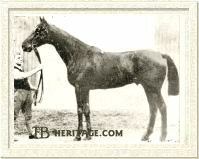 Cypriote produced some excellent daughters that bred high class horses in France, and through daughter Congressiste (1912, by Phoenix), was second dam of two French Oaks winners, Fairy Legend and Mary Legend, both by Dark Legend, and through Fairy Legend, dam of another French Oaks winner, Feerie. One of Congressiste's daughters, Evelyn's Legend, was sold to the Martinez de Hoz Haras Chapadmalal in Argentina, where she became the dam and second dam of a number of classic winners in South America; most of her daughters were bred to the Son-in-Law son, Rustom Pasha (1927, winner in England of the Champion Stakes and Eclipse Stakes), who stood at stud at Haras Chapadmalal. Justitia Le Sancy's daughter JUSTITIA (1886), out of the Frisky Matron, by Cremorne, won the Prix Mornay. In the stud at the Rothschild's Haras Meautry, she produced Prix Rochette (7 furlongs) winner Sly Fox; the stallion St. Just, a good sire at Meautry who got a number of winners, including Jus d'Orange, who figures in sporthorse pedigrees and Highborn II, a good winner in France and England; and a daughter, Reine Mab, who was tail-female ancestress of a number of top stakes winners, including French Oaks winner Timandra (1957), Arc winner Ivanjica (1972), and the good French winner and sire Diatome (1962). TOISON D'OR (1901), from Harfleur, by Archiduc, became the dam of Alcantara II (1908, by Perth), who won the Prix du Jockey Club, the Prix Lupin (2100 meters) and the Prix Rochette (twice), and was twice leading sire in France. Many other Le Sancy daughters proved to be good broodmares and can be seen in the pedigrees of stakes winners in France, Germany, and other parts of the world.